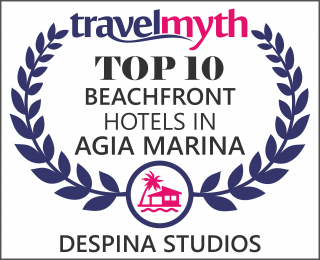 Agia Marina, where DESPINA STUDIOS is located, is only 9km away from the city of Chania. The area abounds in beautiful and organised beaches that can satisfy all expectations and demands. Furthermore, the area offers a wide range of entertainment options, such as, but not limited to, restaurants, beach bars, clubs, and cafes, while there are also super markets, banks and ATMs, travel agencies, and other offices/shops close at hand.